Clouds drift over the jagged outcropping of rock known as the Cathedral Spires. 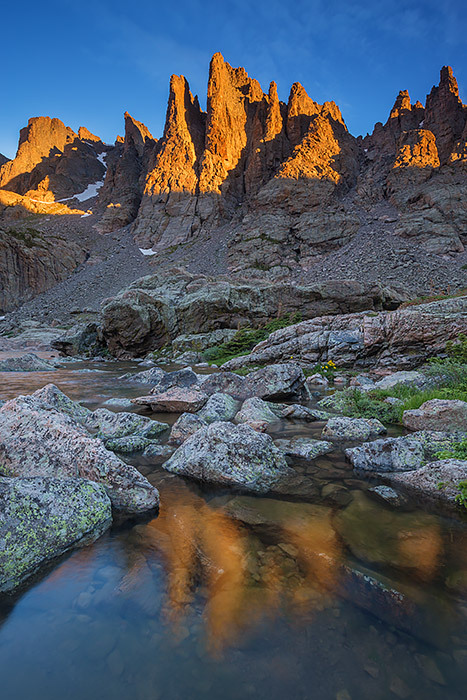 Located at the base of Sky Pond, above Loch Vale these rock formations are some of the most sought after rock climbs in all of Rocky Mountain National Park. The Petit Grepon and The Sharkstooth being some of the favorite of climbers. In this image, the Cathedral Spires reflect in the water of Sky Pond. Photo © copyright by Thomas Mangan.